Claimed to be twice faster using the Intel Core Duo processor (2 processors built into one chip), Apple has released the new iMacs. As for the processor, you’ll get the 1.83GHz with the 17″ iMac or a 2.0GHz with the 20″ iMac. 512MB of DDR2 SDRAM (667Mhz). Full specifications can be obtained from Apple site. This iMac has made it to my wishlist. If only Christmas was tomorrow. As I was scouring the Net, I came across a number of articles that mentioned the Apple iPod Nano flaws. It was disheartening to learn that a very small percentage of iPod Nano devices are experiencing screen cracks. This matter has been reported on sites such as MacWorld, CNet and News.com.com. Apparently, Apple has acknowledge the flaw and have pinpointed the problem to a vendor’s quality problem. Apple claims that this problem occurs only in 1/10 of 1% of the totalled iPod Nano shipped. According to Phil Schiller, Appleâ€™s Senior Vice President of Worldwide Product Marketing, customers can get in contact with AppleCare and get their iPod Nanos replaced. Do you fancy listening to your iPod 60 hours straight without the need to recharge? The future is now closer with Toshiba announcing the testing of their DMFC (Direct Methanol Fuel Cell) prototype. Not only will fuel cells work with iPods, it can practically be made for any electronic equipment that runs on batteries. The iPod Nano is a beautifully designed pencil-thin iPod (that is, the thickness is as thick as a typical pencil) set to replace the iPod Mini. Contrary to the Mini which is a hard drive based device, the iPod Nano uses flash memory thereby making it lighter (1.5 ounces / 42 grams), energy efficient (longer battery life) and 1/3 the size of its predecessor. 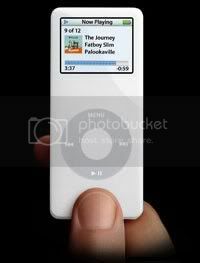 On sale in 2 different storage sizes (4GB and 2GB), the iPod Nano is capable of storing approximately 1,000 songs or 25,000 photos. Not only do you use your iPod Nano for songs and photos, it comes loaded with games and calendar functions. The battery is expected to last 14 hours between recharge. The new iPod Nano comes in either black or white and in 4GB or 2GB storage. The 4GB model retails at $249 while the 2GB model is priced at $199. For more details on the iPod Nano and customer reviews, check out Amazon Store. Firstly, if you are stuck with your PC and have no way to get your hands on a mac, why no get yourself some Mac emulation software or beautify your PC with Mac stuff at http://www.osx-e.com/. Secondly, buying a new Mac can be an expensive affair to some. New Mac users are always very cautious before taking the plunge as they worry that Mac will not suit them. However, to calm those nerves, many Mac users (previously Windows users) said to me that they will never go back to Windows. Instead of buying a brand new Mac, you are able to find a cheaper alternative by buying second hand Mac which may not be the latest version but will still be adequate for most computer users and also to give you the necessary experience in handling the Mac.